Snowmen aren't as cheery when they're trying to snowball you to death. Killing Floor developer Tripwire Interactive is getting into the holiday spirit by holding a Christmas event for all players of its co-op, survival horror shooter. The catch is that it's a Twisted Christmas event, but it still features wonderful gifts for all. In the land of Killing Floor, Santa's workshop is an evil lair, and promotional material shows Santa himself as a terrible cyborg. His helpers are the game's "specimen" enemies, with the gang made up of homicidal elves, giant nutcrackers that will chomp your limbs off, Rudolph the Red-Nosed Crawlers, Mrs. Claws, and an evil Jack Frost just for the hell of it. These creatures might have cute voices, but they'll disembowel you at a moment's notice. All of these monstrosities can be found on Killing Floor's brand new map, Santa's Evil Lair. 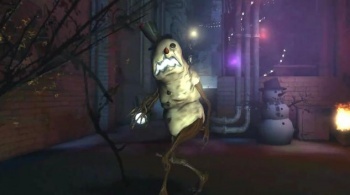 The Twisted Christmas event will run from December 14 to January 4 and will add 13 brand new achievements. Players that can get 10 of these achievements and beat Santa's Evil Lair on any difficulty other than easy will unlock a unique playable character: the Baddest Santa. Tripwire also has more gifts to give during the event, and they both involve Team Fortress 2. All owners of Team Fortress 2 and Killing Floor during the event will get a playable red or blue Team Fortress 2-themed Pyro character to use in Killing Floor. Anyone that already owns Team Fortress 2 and purchases Killing Floor before the beginning of the promotion will get a Mr. Fosters Gas Mask and Tie item to equip on their Pyro in Team Fortress 2. Team Fortress 2 items really are the "in" thing to give away this holiday season, with Valve also awarding free TF2 hats to participants in the Steam Treasure Hunt. They're a nice bonus, but with Mecha-Santa involved, this Killing Floor event could definitely have stood on its own. Thanks for the tip Therandombear!